Constitution for the United States— Correct version, local to this site, with annotations and links to other pages on this and other sites. Constitution for the United States — Correct version, local to this site, with minimal annotations and no local links other than among this document set, for portability across multiple platforms and browsers. This one can be downloaded and used at your site. Constitution for the United States — Color-coded to indicate passages violated or not properly implemented, with links to Reed-Kellogg digrams of some of the clauses. Constitution for the United States — Formatted to print on two sides of one letter-size sheet of paper. Founding-Era Translations of the United States Constitution — The Constitution was translated from English into German and Dutch at ratification, for the substantial number of people in Pennsylvania and New York who did not speak English. This document sets out the different texts and translations alongside one another. 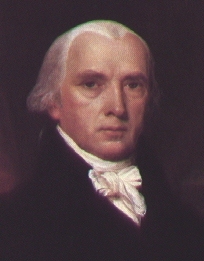 Debates in the Federal Convention of 1787, by James Madison. These are the proceedings of the Constitutional Convention held in Philadelphia. an essential guide to interpreting the intent of the Framers. Also see the mirror site at TeamInfinity. Scanned images of the original pages of U.S. Constitution and Bill of Rights. See also the Charters of Freedom collection at the National Archives and Records Adminstration. U.S. Constitution — Official but incorrect version you will often see. The Annotated Constitution — GPO, CRS [ASCII, PDF], 2444p. Project of the Congressional Research Service (CRS) and Government Printing Office (GPO). Annotated references to Supreme Court decisions arranged by provision and amendment. Acrobat reader needed for PDF files can be downloaded from here. Some very large files. U.S. Declaration of Independence — Original capitalization. U.S. Declaration of Independence — Modernized capitalization. The Federalist Papers, James Madison, Alexander Hamilton, John Jay. Also see the versions from Rob Knautz, Liberty Online, Perfect Union Project, and the gopher site: Wiretap. Anti-Federalist Papers — Various essays criticizing the proposed Constitution and urging changes. See the collections at Iahushua and Logoplex. The Debates in the Several Conventions on the Adoption of the Federal Constitution, Jonathan Elliot (1836) — A collection of documents, including proceedings of the ratifying state conventions. Documentary History of the Bill of Rights — From the English Bill of Rights through the proposed amendments of the state ratifying conventions to the drafts debated in Congress before adopting the final version. Primary Sources — Extensive collection of links and documents from Rick Gardiner. Constitutional Quotes — Some quotes that enlighten understanding of the Constitution. History & Economics Related to Constitutional Matters — Articles on facts and conjectures. The Athenian Constitution, Aristotle (350 BC). Also see the site at MIT. Constitution of the Iroquois Confederacy. Declaration of the Rights of Man and the Citizen (Marquis de Lafayette, Thomas Jefferson, 1789) — Manifesto of the French Revolution, expressing its ideals. Supreme Court Decisions — Findlaw collection. Supreme Court Decisions — Cornell collection. Only has recent ones. U.S. Constitutional Law — Cornell archive. Farrand's Records — Library of Congress collection. Elliot's Debates — Library of Congress collection. U.S. Congressional Documents and Debates — Library of Congress collection. Letters of Delegates to Congress — Library of Congress collection. Journals of the Continental Congress — Library of Congress collection. National Constitution Center — Mainly a bricks and mortar museum, but has online materials. U.S. Government — Starting point for U.S. Government Hypertexts. U.S. Historical Documents — Collection at the University of Oklahoma. Pirate Code (Articles of Agreement) — Pirates often had written constitutions, too, and many pre-dated those of the United States. Dead links — Please help us find replacements. The Constitution is a written instrument. As such, its meaning does not alter. That which it meant when it was adopted, it means now. Vindicating the Founders, Thomas G. West — Defense of the Founders' views and actions on slavery, women's rights, property rights, voting rights, and other controversial issues. University of Virginia, Electronic Text Center — Have writings of Thomas Jefferson. Thomas Jefferson on Politics and Government — Things Thomas Jefferson wrote. James Madison Legacy — Archive of James Madison University. Franklin Institute Benjamin Franklin archive — The Founder who contributed most to the concepts of federalism. The Writings of George Washington from the Original Manuscript Sources 1745-1799 — Complete collection at the University of Virginia. First in Peace: George Washington — Celebration of the indispensible man of the second millenium of the common era. Citizen's Rule Book, ed. Webster Adams, Whitten Printers, 1001 S. 5th St., Phoenix, AZ 85004, 602/258-6406. Read it online here or here. The U.S. Constitution, ed. Robert F. Tedeschi, Jr., Oak Hill Publishing Co., Box 6473, Naperville, IL 60567. Federalist Society — Coalition of conservative and libertarian lawyers and legal scholars. Heritage Foundation — Publishes the Policy Review. Cato Institute — Have volume discounts. National Constitutions — The supreme laws of many of the most important countries, for comparative analysis. The principles of constitutional republicanism are universal. Ask how well each of these constitutions realize those principles. See also the ICL sites at Wuerzburg and Cornell, ForInt-Law, Galaxy/Court Law Center, LawMarks, WVNet , IACL, Wiretap, LeftJustified , the Georgetown archive of Latin American Constitutions, and the University of Richmond directory Constitution Finder. Constitutions of Europe — Links and discussion of European constitutions. Documenting a Democracy – Australia's Story — Collection of the National Archives of Australia. Student Government — The principles of constitutional republican government also apply, with some adaptations, to this formative experience of future constitutionalists. Constitutionalism — Sometimes equated with the "Rule of Law", holds that government can and should be legally limited in its powers, and that its authority depends on enforcing those limitations. Also see our links to Books and Publishers for things like prints of documents.